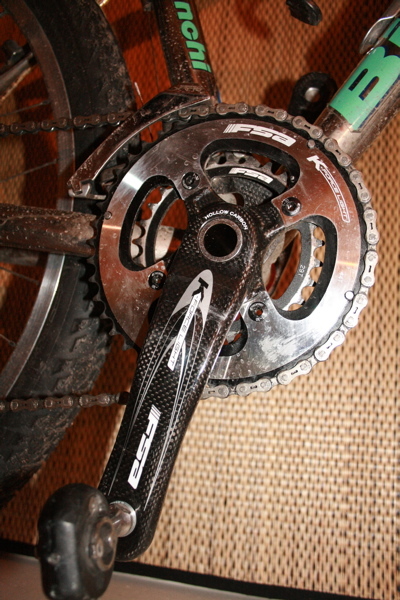 I’ve been running a FSA K-Force Light mtb crank and ceramic BB on my dropbar Bianchi mtb for a week and a half now. With little free time and no car to get out to real trails, I’ve had to satisfy myself with urban playtime and I have some things to say about the K-Force Light. In short, I like this crank a lot, and I have to say that I have in the past generally disliked FSA cranks. 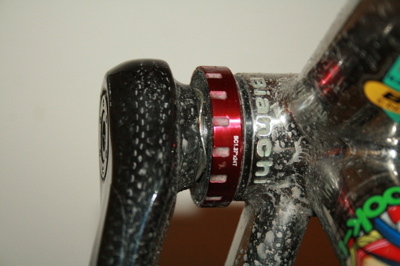 Previous opinion was formed on earlier model cranks that had crappy chainrings, bad left arm/spindle interfaces (a good design wouldn’t require GLUE to install the arm to the spindle), and BB designs that were too dependent on BB width tolerances. As a buyer and mechanic, I didn’t like selling FSA cranks to customers. However, I was surprised by the K-Force Light crank. This design uses a wave washer between the left arm and BB cup to handle side loads and BB shell tolerances. You basically just tighten the left arm onto the spindle and forget about any bearing preload adjustments. Simple yet effective. The ceramic BB is smooth enough that I can actually feel the difference while riding. It’s not huge, but it’s there. Of course it is way too soon to comment on the BB’s durability though. I am also favorably impressed by the shifting performance of the rings. I am using the 2×9 version that has a 44/29 ring combo. Much like road compact cranks, the shift is difficult to engineer due to the large difference in the chainring diameters. Going from the small ring to the big is a big 15tooth jump, but the ramped and pinned rings of the K-Force Light do well lifting the chain into place. As a comparison, shifting under power is much better than my old 2×9 Coda Tarantula crank. Compared to my M960 XTR crank, I don’t feel any significant difference in stiffness. 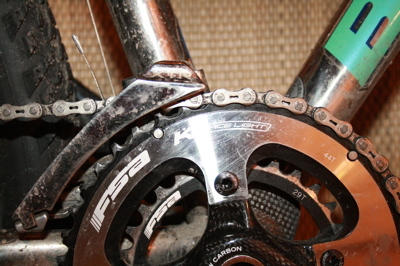 The FSA crank/BB is lighter by some 100gr or so. I wouldn’t say the crank is perfect. Unfortunately, the Q-factor is no less than the XTR crank (161mm), probably due to the need to clear wide chainstays as well as the need to share tooling with the standard (ie triple chainring) K-Force Light crank. The chainline is reduced somewhat but not as much as it might have been. One future issue might be chainring availability. The standard K-Force Light crank probably limited the 2×9 derivative to a four-arm spider, but FSA ditched the 104mm bcd in favor of the very unusual 95mm FOUR-ARM bcd to accommodate the 29tooth inner ring. Finally, these things are pricey. Mine is a 2008 model, but the 2009 should retail for $800-850. Ouch.